Our mapping investigation reveals that washboard and fluted terrains, which are among the most baffling landforms on Pluto, comprise fragmented crustal debris that was deposited after recession of ancient nitrogen ice glaciers. But further work is needed to uncover all the secrets of this geological enigma. The flyby of the Pluto system by NASA’s New Horizons spacecraft in 2015 revealed Pluto to have an astounding geological diversity. A subtle but very distinctive landform category is the washboard and fluted terrains, located in uplands to the northwest of the sprawling nitrogen ice plains of Sputnik Planitia. These terrains consist of sub-parallel ridges, spaced a few kilometers apart, that show a remarkably consistent east-northeast–west-southwest orientation. This morphology can’t be explained by any simple analogous terrestrial or planetary process or landform, so I decided to lead a study involving several members of the New Horizons science team to map the ridges and quantify their morphological and distributional properties in order to determine how they had formed and what significance they might have for Pluto’s overall geological history. Location and coverage of the washboard and fluted terrains on Pluto. The mapping revealed that the valleys and plains on Sputnik Planitia’s perimeter where the ridges primarily occur represent some of the lowest topography yet seen on Pluto outside of Sputnik Planitia itself. This is a natural location for the precipitation of nitrogen ice, and suggests that past nitrogen ice glaciation may have contributed to the creation of the ridges. But other parts of Pluto are interpreted to have experienced former glaciation as well, so what was special about this place that caused the ridges to form? We also found that the ridges happen to coincide with where an ancient 3,200-km-long, trough-ridge system intersects the perimeter of Sputnik Planitia. This caused us to hypothesize that the ridges represent some form of refractory material that was mobilized by glacial ice and then deposited after the ice receded away. Specifically, fracturing of Pluto’s water ice crust by this large-scale extensional tectonic system would provide a source of such material that could be manipulated by the denser glacial nitrogen ice, explaining why the washboard and fluted terrains only occur here. Washboard ridges covering a valley floor (black arrow) and fluted ridges covering a spur (white arrow). As for the peculiar ridged morphology, the pitted plains in southern Sputnik Planitia provide a potential present-day analogue. The sublimation pits in the nitrogen ice here tend to be elongated and to align in parallel chains, the texture and scale of which bear a noticeable resemblance to the ridges of the washboard and fluted terrains. If the glacial nitrogen ice that formerly covered the uplands developed a similar pitted sublimation texture, then any buoyant crustal material mobilized by the nitrogen ice would naturally move downslope to cover the floors of these pits. Upon recession of the nitrogen ice, the concentrations of crustal material in the aligned, elongated pits would be left behind as a record of this sublimation texture in the form of ridges draped over the landscape where the glacial ice had been. 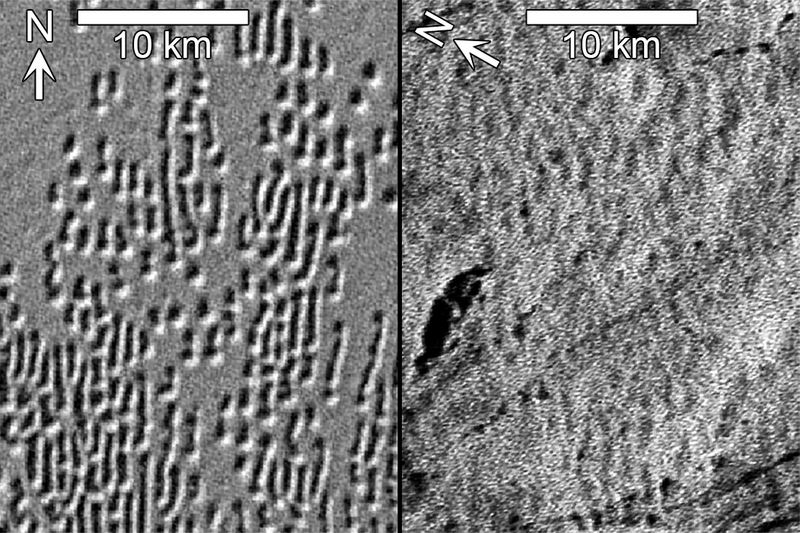 Chains of elongate sublimation pits in southern Sputnik Planitia (left) and ridges of washboard terrain (right), shown to the same scale. But what is the context for such glaciation and its eventual recession in Pluto’s history? This is answered by our crater density-based terrain age estimates, which show that the washboard and fluted ridges, and therefore the glaciation that deposited them, is very ancient: the ridges had likely been deposited by ~4 billion years ago. The impact basin containing Sputnik Planitia is the oldest identified geologic structure identified on Pluto, and it acted as an incredibly powerful cold trap, with surface nitrogen ice from across Pluto migrating via sublimation and recondensation to fill the basin. 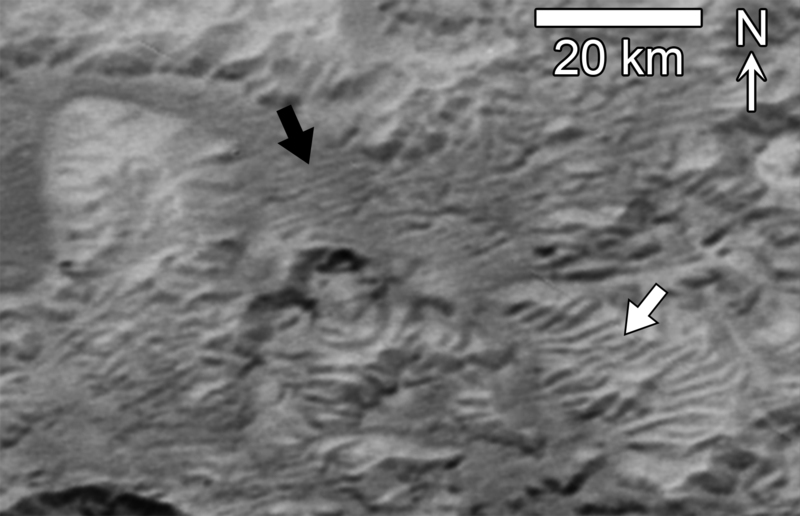 The appearance of the Sputnik basin therefore provides a mechanism for the nitrogen ice to recede early in Pluto’s history, leaving the ridges in its wake. Yet there was one last remaining puzzle that we had not yet resolved: why does the orientation of the ridges display such a strong east-northeast–west-southwest trend, regardless of latitude or location relative to Sputnik Planitia? We were stumped when we tried to think ofa process that would have imparted such a consistent and eccentric orientation to the ridges, and then we considered the possibility that the ridges had not always been oriented this way. As it so happens, James Keane, a researcher at CalTech, had independently speculated in his 2016 study on inferring True Polar Wander of Pluto from its tectonics that the washboard ridges might originally have been aligned north-south. Given that sublimation often creates geologic features that orient north-south (such as penitentes on Earth), the attractiveness of Pluto reorienting itself in response to True Polar Wander as a means to explain the strange orientation of the ridges was obvious. We brought James on as a co-author, who set to work assessing the degree to which the ridges align with lines of longitude for the paleopole solutions (i.e. 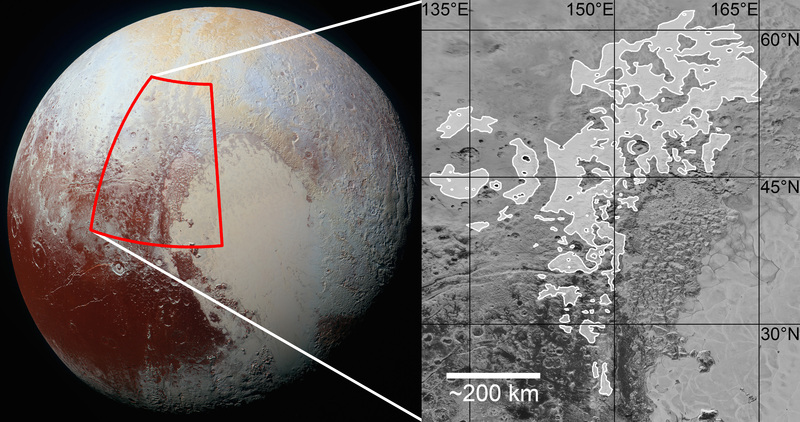 locations of Pluto’s pole prior to True Polar Wander) he had generated for his earlier study. Unfortunately, we found that the paleopole solutions were inconsistent with the washboard and fluted ridges having all been aligned north-south prior to Pluto’s reorientation, meaning that True Polar Wander cannot be explicitly linked to the formation of the ridges. The cause of the ridges’ orientation therefore remains a mystery, but we are confident that the distributional, morphological, and crater age evidence still points to an ancient, glacial origin for them. Eventually, I hope to further tackle the problem of how these fascinating features originated by using physics-based landform evolution modeling to quantitatively evaluate the feasibility of the processes we think are involved.